Seminar "Clean water and sustainable development: policy issues"
Current situation poses on the need to have proper perspective about the issue of water pollution as a threat capable of causing a tremendous impact on the whole society to a large extent both in space and time as well as review of relevant policies which heavily oriented and lack of specific guidance. In the field of environmental protection, water pollution control is the most critical and strategic mission because water is the source of life. Protecting water quality, as well, is the content of the two among the 17 sustainable development goals to be achieved in the next 15 years of the Global UN Sustainable Development Conference in 2015. Environmental disasters in the first months of 2016 caused heavy damage to farming, fishing and tourism, and ecological devastation, which is an alarm bell about pollution control issues of surface waters, including rivers, lakes, and coastal waters, in Vietnam. Protecting water quality of surface waters is also protecting the livelihoods of the people associated with fisheries resources, tourism services and other services related to water, and therefore must become a priority in environmental protection. Although we have the Law of Environmental Protection (revised 2014) and the Water Resources Act (amended in 2012), but the effectiveness of these laws in the control of water pollution is still very limited, leading to quality water environment continues to be degraded and water pollution incidents continues to be severe. 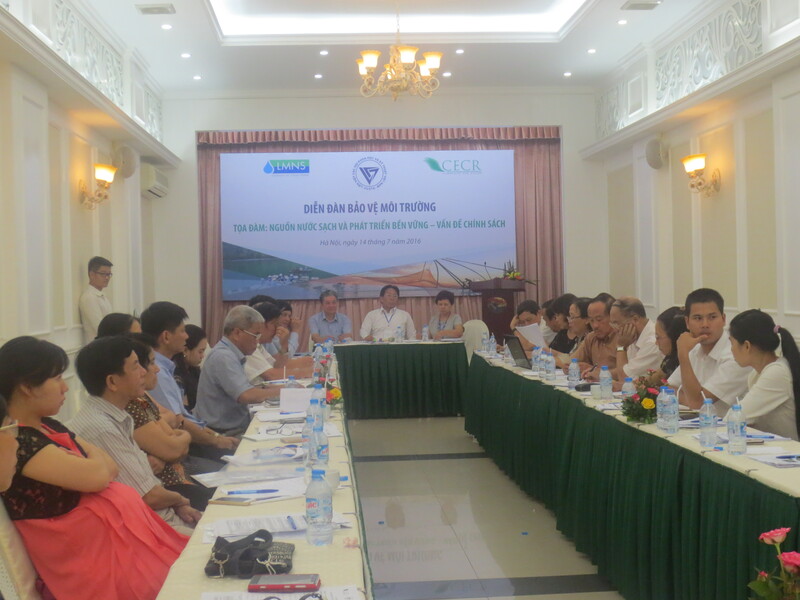 In the framework of the Forum on Environmental Protection, Vietnam Union of Science and Technology Associations (VUSTA) in collaboration with Clean Water Alliance organized seminar “Water Resources and Sustainable Development: Policy Issues” in order to create a space for open discussion about the importance of ensuring clean water for sustainable development and measures to overcome the shortcomings of policies on water pollution control nowadays. This seminar will contribute useful information for policy makers to prevent, respond to environmental issues as well as improving the environmental quality of surface water in the future of Vietnam.